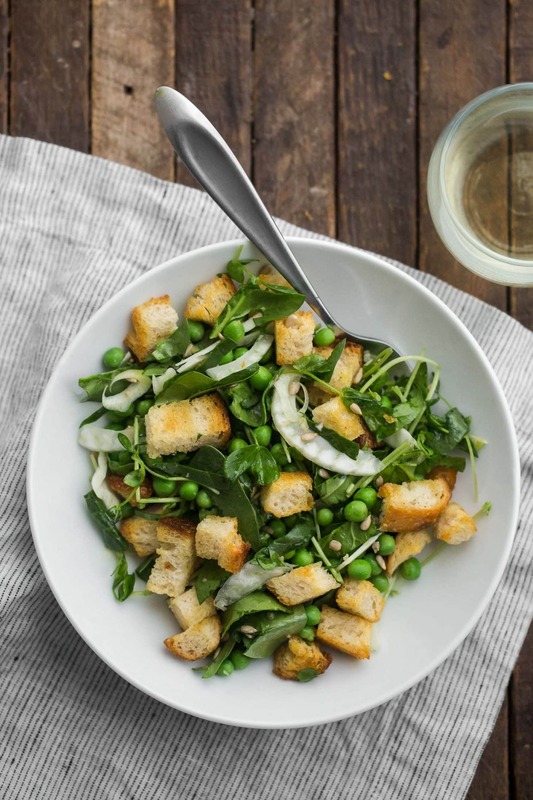 Spring Panzanella with Peas and Fennel | Naturally. 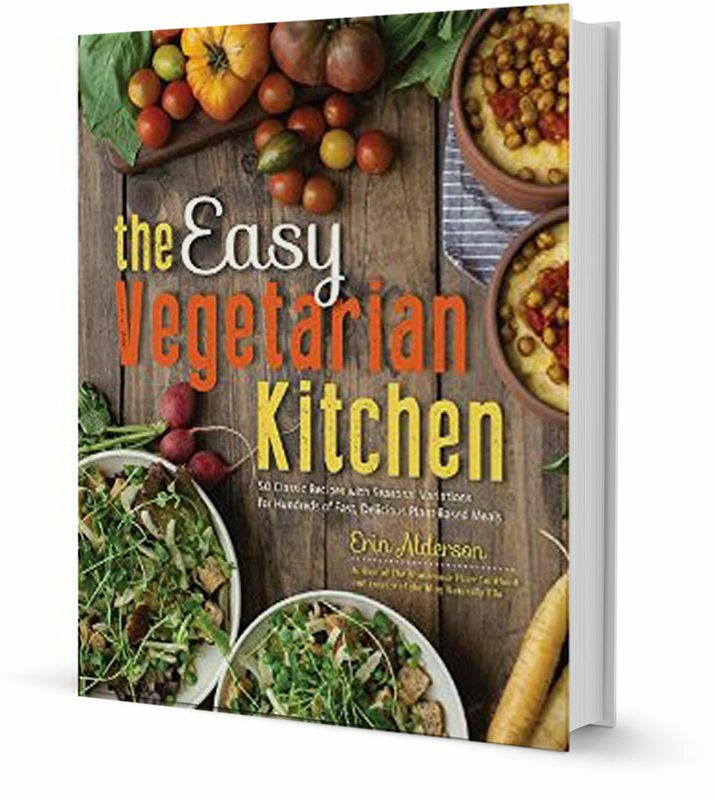 Given the shear amount of recipes I try, there are some I make for the blog or books that I never make again. However, there is a core group that I have a hard time letting go. These are the recipes that I turn to when I want something solid or are the recipes that I just love. This spring panzanella is one of those recipes. 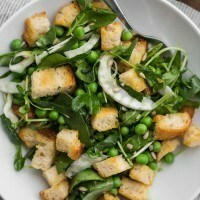 While not a traditional panzanella, this salad brings in some of my favorite flavors of spring with fennel and peas. Can’t find pea shoots? You can grow your own. 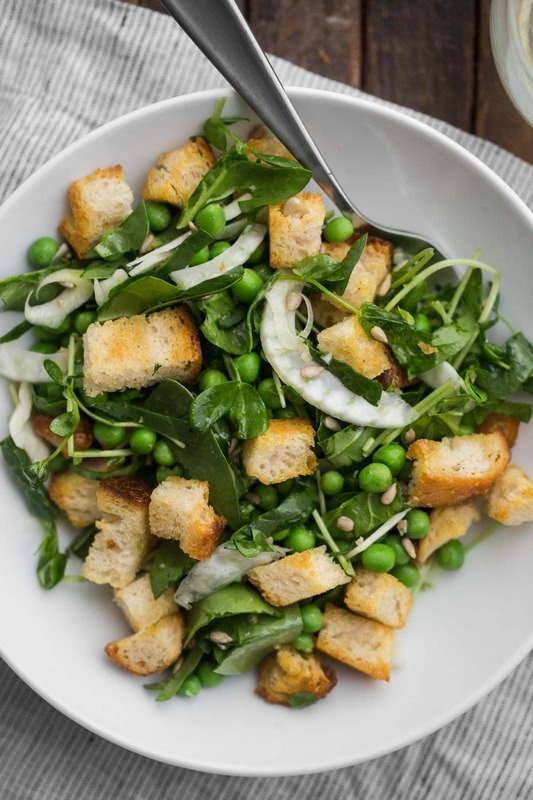 The peas and pea shoots are what makes the salad for me- the combination feels like you’re eating spring packed into a salad. You can really use any bread you might have on a hand (occasionally I use a hearty, seeded loaf of bread) and as mentioned above, the garlic scapes can be swapped for something more readily available. Add Cheese: A crumbly cheese is the perfect addition- try adding feta or goat cheese to the salad. Make it Gluten-Free: Use your favorite loaf of gluten-free bread to make the cubes. Fennel: This salad can be made without the fennel. Add a few more diced scallions and you could even add a bit of shaved asparagus. Such beautiful pictures! I love this salad!! I can see why this would be a favorite. I love the idea of fennel/pea combination.